Q: Do you need to set watermarked page range? 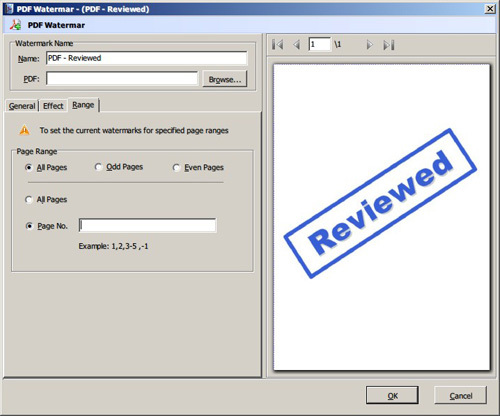 The PDF to FlashBook Professional software provides the watermark feature so that you can add stamps or watermarks to your copyrighted publications. You can use both the built-in watermarks and your own watermarks that you imported. Further, you can also set a range of pages that watermarks will be added if you don’t need all the pages watermarked. Click “Set watermark” button in the “Add file” tab. In the new popup watermark setting window, select “Range” tab. You can set the watermark add to the odd pages or even pages, or even set page numbers to add.